With 25 Year Penalties Possible, Can the DA Make An Offer No One Can Refuse? 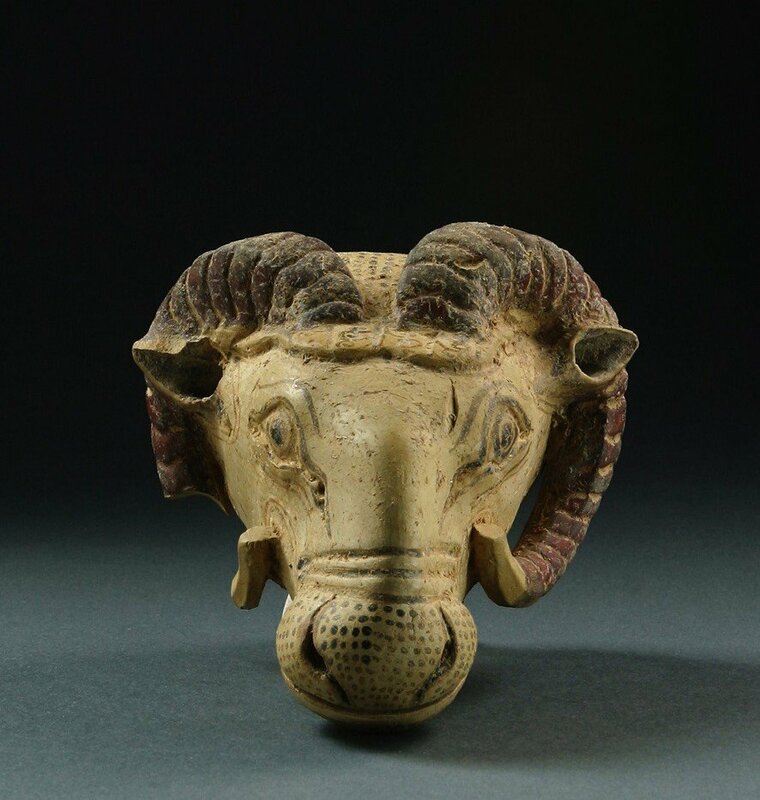 Ionian Ram's Head, Photo courtesy of the Manhattan district attorney. Over the last few months, headline seizures of artworks from well-known private and public art collections dating back twenty, fifty, and even seventy years have raised questions about the methods of the Manhattan District Attorney’s office. In January, warrants for artworks with an exhibition and ownership history going back to 1984 were also served on a major antiquities gallery in New York. 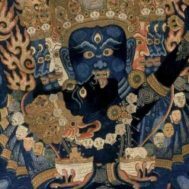 The recent seizures are based on foreign ownership laws nationalizing artworks or on theft claims that were not raised by foreign governments until they were contacted by New York authorities. The identifications of the artworks as ‘stolen property’ were made from secret files unavailable to the public. And the threatened penalties – up to 25 years’ imprisonment – are based on a NY law intended to curb illegal trade in stolen goods. Federal prosecutors have not been involved (although Homeland Security has taken part in raids on homes and galleries), even though the issues are international, and the artworks are all claimed to be looted or stolen from foreign countries decades ago. 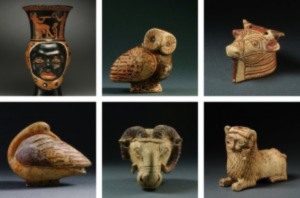 Instead, a newly formed antiquities trafficking bureau at the office of the District Attorney of New York County is aggressively pursuing these ‘antique’ cases. The antiquities trafficking unit, under the leadership of assistant district attorney Matthew Bogdanos, was officially inaugurated by DA Cyrus Vance in December 2017. The bureau appears to have been interested in targeting collectors and museums from the beginning. Ads placed for ‘Antiquities Trafficking Analysts’ in August 2017 stated that the District Attorney needed staff to provide “critical analysis of records for use in criminal prosecution against trafficking participants such as looters/thieves, smugglers, financiers, shippers, gallery owners, restorers, on-line sites, conservators, auction houses, museum curators, and other facilitators, whether individuals or corporations…” The annual salary for an analyst was almost $45,000. 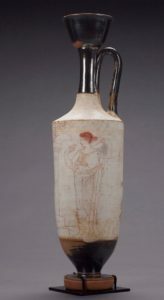 Attic White-Ground Lekythos. Steinhardt Collection. Photo courtesy of the Manhattan district attorney. The collectors and dealers subject to recent seizures are very prominent. What follows is only a partial list of seizures in 2017-2018, starting with the most recent. The merits of each case are different, and the circumstances vary greatly – but two factors stand out. In each, the action was not prompted by any ‘victim’ but instead by the District Attorney’s office (the source countries didn’t come into play until the investigations were well on their way). And in each case, the object had been outside of the country of origin and in either a museum or private collection for a very long time. The warrants also directed the Manhattan District Attorney to seize computers, books, notes, photographs, recording, address and datebooks, and all documentation “not privileged.” The trigger for the seizure was the prosecutor’s location of photographs of ten objects now in the Steinhardts’ collection, among the 20+year-old records of suspect Italian antiquities dealers. The objects seized from Mr. Steinhardt were nine ceramics from various Greek, Italian and Cypriot locales and a pair of large bronze handles. The most valuable item was a Greek Attic Monumental White-Ground Lekythos that had been purchased in 2006 for $380,000. Other objects were valued between $25,000 and $130,000. In late January, after prosecutors went through Mr. Steinhardt’s computers and records, another warrant was issued to seize a tiny statuette from him. This statuette was a marble female idol of the Ozieri Culture from Sardinia that had not only been published and offered for auction in New York at Christie’s in December 2014 but had belonged to several prior owners before Mr. Steinhardt. At the time of the Christie’s auction, a private antiquities hunter, Christos Tsirogiannis, had identified this item as similar to an image from the secret archives of former dealer Giacomo Medici. Tsirogiannis had contacted US federal and Italian authorities, who were not interested in pursuing the matter, but Vance and Bogdanos jumped on it. The Steinhardt and Phoenix Gallery seizures were just the latest in a string of cases, aimed at objects long circulating in the market and with a significant exhibition history. In December, District Attorney Vance announced the return to Lebanon of three sculptures seized from Colorado private collectors Lynda and William Beierwaltes, one of which was on loan to the Metropolitan Museum. The statues were eventually identified as coming from a state-sponsored archaeological excavation in Lebanon in 1967. When told that their statue of a bull’s head could be seized from the Metropolitan Museum, where it was on loan, the Beierwalteses sued, asserting that they had purchased the object in good faith and raising statute of limitations and other legal issues. After discussions with the District Attorney, the Beierwalteses conceded that there was proof that the statues had been taken from a storage facility in Lebanon at some point, probably during its civil war. The Beierwalteses were not charged with any wrongdoing. Police have also delivered warrants and seized objects from New York art fairs. In October 2017, NY police seized a fragment of a limestone bas relief from Persepolis in Iran from the booth of English art dealer Rupert Wace at New York’s Park Avenue Armory. The relief was valued at $1.2 million. Wace had purchased it from an insurance company, which had acquired it from the Montreal Museum of Fine Arts, where it had been exhibited for fifty years. A New York court recently denied the District Attorney’s request to return the Persepolis fragment to Iran, stating that it should be held in custody until determination of the ownership of the relief by “a more appropriate forum, such as a court with civil jurisdiction.” Judge Melissa C. Jackson noted that no criminal charges had been filed in the matter. 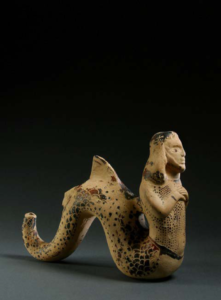 Corinthian Sea-Serpent figure with a human torso and head of a man. Photo courtesy of Manhattan district attorney. The Canadian courts do not have jurisdiction over NY cases, but nonetheless stepped in, in response to a request by AXA, the insurance company that sold the fragment. Quebec Superior Court Judge Babak Barin issued an order on November 21, 2017 that the Persepolis fragment should not go to Iran without a proper determination of ownership. The Canadian judge granted time for the lawyers to present their cases and sent a copy of his ruling to the NY judge. Judge Barin said the court needed to decide if the fragment was actually legally imported into Canada in 1951, or alternately, if the fragment’s long residence in the Montreal Museum of Fine Arts gave the museum good title, so that the sale from the AXA Insurance Company to Rupert Wace was lawful. Another object, a fragment of mosaic from Italy, was seized in October from the New York home of European antiques dealer, Helen Fioratti. Mrs. Fioratti said that she and her late husband, a journalist, purchased the mosaic decades before from an aristocratic family in Italy. According to the couple, the deal was brokered by an Italian police official “famed for his success in recovering art work looted by the Nazis.” The mosaic fragment was sent to Italy. One seizure interrupted ongoing talks between the Metropolitan Museum and a source country arranging a return. In July 2017, the District Attorney seized an ancient Greek vase from the Met Museum that the museum had purchased in 1989 and exhibited ever since. The Met had contacted cultural officials in Italy after learning that it might have come from a suspect Italian art dealer, and had been discussing its possible return with the Italian government for over a year. While the Italians delayed, the NY prosecutor swooped in and took it, making headlines that ignored the fact that a return was already in the works. High profile cases with high dollar values certainly bring attention to law enforcement. There may be reasons to ask, however, if this is the most appropriate use of District Attorney funds and energies. It sounds like there is a lot of criminal activity going on; after all, i­­n announcing the bureau’s creation, Vance said that his office has seized some $150 million dollars’ worth of looted antiquities since 2012. But could these claims be overblown? Screenshot from Hidden Idols video of NY seizure of Subhash Kapoor inventory. The bulk of this supposed $150 million comes from artifacts seized in an investigation, code named Hidden Idols, of Indian art dealer Subhash Kapoor that actually began in 2007 – said to be worth over $100 million. However, the police inventory of the Kapoor seizures lists values higher than any similar objects have sold for, and several experts working from video images and press photographs have identified approximately half the objects as obvious fakes. Seizing US Art to Benefit Foreign Countries? While the DA’s office implies that its aim is to halt the looting of antiquities – certainly a noble endeavor – it doesn’t appear that a single one of the high-profile seizures that followed the bureau’s creation involve newly looted artifacts. In fact, the New York cases concern objects that left the source countries at least 25-75 years ago – uncommonly old ‘crimes’ for a police investigation. Nor are they based on complaints by the alleged victims of theft, the countries from which the items are said to have been taken decades before. The source countries are eager enough to have the objects back once they were seized and prosecutors had contacted their cultural ministries. No object, however, had been reported stolen by the source countries in the first place, although international art registries for stolen objects have been in existence for decades. Some art world watchers have also expressed concern that the NY District Attorney’s office is entangling itself in issues that are not clearly under its jurisdiction, for example, in the case of the bas relief fragment from Persepolis, to benefit Iran, a foreign nation that is inimical to US interests. In addition, the bas relief belonged to a Canadian museum for over 50 years, and its seizure could entangle both the museum and the insurance company that sold the fragment in litigation for years. In another case, of a Greek vase also identified as having once been in the hands of a discredited Italian dealer, was it reasonable for the District Attorney to seize it from New York’s Metropolitan Museum when the museum was already in talks with the Italian government about its return? Especially when the Association of Art Museum Directors, of which the Met is a member, has been actively seeking release of the secretly held documents that the seizure was based upon, so that museums can perform proper due diligence? Since the source countries never reported any thefts, what triggered these New York seizures? For years, the Italian police have held photographs from the files of members of a previous generation of art dealers who were charged with selling illicitly exported or looted objects. The police have given access to these files to a few self-styled “antiquities hunters,” who use them to track down artworks when they show up decades later, often after having passed through many hands. The antiquities sleuths then contact news media and authorities to push for the object’s return. Group of items seized from Phoenix Ancient Art. Photo courtesy of Manhattan district attorney. Police have had this dossier since 2001, and a similar trove of images from Giacomo Medici since the 1990s, but will not allow museums to access them (although Chasing Aphrodite bloggers stated in 2011 that they had “reviewed the Becchina dossier”). By providing this information to bloggers and self-styled sleuths, while withholding it from museums, the police have harmed international museums by placing them in the spotlight for accessioning objects that they had no chance to investigate. Unfortunately, despite years of requests from museums, auction houses and others who wish to perform due diligence and legitimately research provenance, these dossiers have never been made public. The Association of Art Museum Directors has several times made the point that without access to the dossiers, they have no way of knowing that the artworks are even suspect. 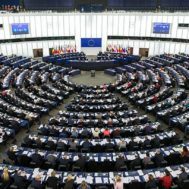 The Italian government has benefited from US agreements blocking imports for 18 years, but art museums, auction houses, and art dealers are still waiting for release of the documents from closed cases that would enable them to do due diligence on acquisitions. The threat of prosecution for possession of illicitly trafficked antiquities is not only real in New York, but truly frightening. While no federal prosecutor has made any move to prosecute cases as old as the current crop of NY seizures, or to go after owners of antiquities who acquired them through museums, auction houses, or dealers in the United States – the NY District Attorney appears not only willing, but eager to make such cases. One reason may be that the New York DA has a convenient legal tool in hand: New York laws intended to prosecute dealers in stolen property as well as shifty pawnbrokers and ‘fences’ of stolen items. These laws were originally designed to deal with sales of ordinary commodities that were stolen, or “fell off a truck.” Essentially, they require dealers to have invoices showing the ownership history and transfer records of goods they deal with. A dealer in secondhand items has a duty to inquire into the provenance of goods he acquires. Applying rules intended to curb criminal activities by sellers of stolen jewelry or cans of tuna fish to the transfer of artworks that have circulated for many decades has obvious problems. First and foremost, there are rarely invoices and other records going back decades to show prior ownership. Second, as the Association of Art Museum Directors noted, the owners of antiquities do not have the opportunity to make provenance investigations when the authorities refuse to make photographs of suspect items public. Today, art dealers are far more circumspect in what they acquire, and have better records of provenance. ‘Good’ provenance, generally defined as a lengthy ownership history, is a selling point, and may affect the price of an object as much as its artistic quality or historical importance. But US Customs never required (or even asked for) the kinds of documentation that the New York DA now considers necessary proof of legal ownership until around 2000. If collectors and dealers had such documentation decades ago, there was no reason to keep it. Even today, no “permit” is required to enter antiquities from many countries into the US – only an honest declaration of age, value, and country of origin. Criminal Possession of Stolen Property in the Second Degree (NY Penal Law 165.52), the crime for which evidence was sought in the warrant issued for Mr. Steinhardt’s home and office, is a very serious charge in New York. Conviction can result in a sentence of up to 15 years in state prison. (Criminal Possession of Stolen Property in the First Degree, a charge that is based on possessing stolen property of a value of one million dollars, is punishable by an up to 25-year sentence.) Since prosecutors may be able to aggregate values over time, possession of a collection of dubious provenance valued at one million dollars could theoretically result in imposition of such a sentence. The idea that a successful hedge fund manager, philanthropist and pillar of the community would ever face prison for not knowing enough about the history of an artwork he possessed appears ludicrous. Nonetheless, for less well-heeled collectors, or foreign art dealers temporarily showing at US art fairs, the possibility of facing such serious criminal charges could be an inducement to agree to give up objects when asked, regardless of their legitimacy and good title. And it will certainly alarm art collectors and art dealers in New York to learn that their District Attorney has dedicated enormous energies and significant government funding to chasing after cases from 10-25-50 and even 75 years ago, when standards were different and detailed records were not retained. In most cases, the NY DA’s office has based its claims that items were “stolen” on foreign “national patrimony” laws that nationalize all the art of a country over a certain number of years in age, making the foreign government the “owner” of all art, historical documents, etc., even the religious artifacts of minority communities, and often of objects that were previously privately owned. Thus, the NY prosecutor is defending the ownership rights of governments such as Iran, Iraq or Turkey, in situations that might be deemed an unconstitutional taking of private property in the US. The quality of legal analysis in the complaints brought against current owners has been variable. The foreign law analysts used by the District Attorney have ranged from knowledgeable art law specialist attorneys to non-lawyers from archaeological advocacy groups. Claiming that an artwork that has been circulating outside of a foreign nation is “stolen” under US law is tricky; that determination is affected by what the foreign law was at the date of export, how it was enacted, on its accessibility and availability in translation, on whether the law was enforced at the time, and on other factors. These nuances within US law appear to have been glossed over by the District Attorney’s office in the past. Cultural Property News has noted several previous instances in which the NY prosecutor has ignored the valid dates of foreign laws in the case of a Japanese art dealer arrested during Asia Week in NY in 2016, or that the source country’s other official actions contradicted their national patrimony laws. An example of this is that long after passage of the Iranian law cited by the DA in the Persepolis fragment case, Iran’s government sold ‘digging permits’ to the highest bidder, whether it was to visiting archaeological expeditions, art dealers or even local professional looters. 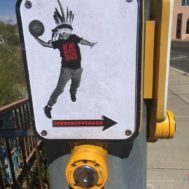 These and other errors and omissions are reason enough for the art community to be vigilant, and to demand assurances that the District Attorney’s office will not overstep the law.